I have come across very few people in my life, who can solve complex problems effortlessly. I always wondered why? As usual I came up with an answer. For a very long time I never realized that it was a first conclusion bias. Some time back in the book Thinking Fast and Slow by Daniel Kahneman, I came across the following story. The psychologist Gary Klein tells the story of a team of firefighters that entered a house in which the kitchen was on fire. Soon after they started housing down the kitchen, the commander heard himself shout, “Let’s get out of here!” without realizing why. The floor collapsed almost immediately after the firefighters escaped. Only after the fact did the commander realized that the fire had been unusually quiet and his ears had been unusually hot. Together, these impressions prompted what he called a “sixth sense of danger.” He had no idea what was wrong, but he knew something was wrong. It turned out that the heart of the fire had not been in the kitchen but in the basement beneath where the man had stood. We have all heard such stories of expert intuition. The chess master who walks past a street game and announces “White mates in three” without stopping or the physician who makes a complex diagnosis after a single glance at a patient. Expert intuition strikes us magical, but it is not. This is not a magic or born genius. Grand Master Viswanathan Anand playing chess simultaneously with multiple players. How is this possible? The situation has provided a cue; this cue has given the expert access to information stored in memory, and the information provides the answer. Intuition is nothing more and nothing less than recognition. Expert players could look for just a few seconds at a chessboard with a real chess position, including as many as twenty-five pieces, and recall it perfectly, while novices could look at the same board and recall the places of only five or so pieces; but when the chess positions were random, experts could recall scarcely more than the novices. The conclusion was that top-ranked chess players did not posses incredible general memories but did posses an amazing ability to remember real chess positions. Deliberate practice is characterized by several elements, each worth examining. It is activity designed specifically to improve performance, often with a teacher’s help; it can be repeated a lot; feedback on results is continuously available; it’s highly demanding mentally, whether the activity is purely intellectual such as chess or business-related activities, or heavily physical, such as sports; and it isn’t much fun. By doing deliberate practice they are building a mental model – a picture of how their domain functions as a system. This is one of the defining traits of great performers. This should explain how Viswanathan Anand played chess simultaneously with multiple players. A mental model is a representation inside your head of an external reality. A large part of the difference between the experienced decision maker and the novice in these situations is not any particular intangible like “judgment” or “intuition”. If one could open the lid, so to speak, and see what was in the head of the experienced decision-maker, one would find that he had at his disposal repertoires of possible actions; that he had checklists of things to think about before he acted; and that he had mechanisms in his mind to evoke these, and bring these to his conscious attention when the situations for decisions arose. When you first start to study a field, it seems like you have to memorize a zillion things. You don’t. What you need is to identify the core principles – generally three to twelve of them – that govern the field. The million things you thought you had to memorize are simply various combinations of the core principles. What is elementary, worldly wisdom? Well, the first rule is that you can’t really know anything if you just remember isolated facts and try and bang ’em back. If the facts don’t hang together on a latticework of theory, you don’t have them in a usable form. You’ve got to have models in your head. And you’ve got to array your experience—both vicarious and direct—on this latticework of models. You may have noticed students who just try to remember and pound back what is remembered. Well, they fail in school and in life. You’ve got to hang experience on a latticework of models in your head. What are the models? Well, the first rule is that you’ve got to have multiple models—because if you just have one or two that you’re using, the nature of human psychology is such that you’ll torture reality so that it fits your models, or at least you’ll think it does. 3. Why should we have models from multiple disciplines? 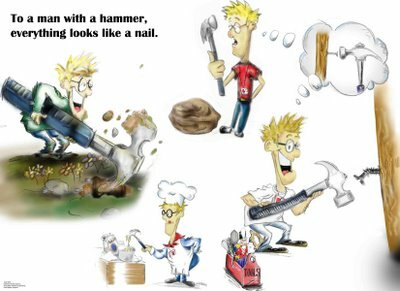 It’s like the old saying, “To the man with only a hammer, every problem looks like a nail.” And of course, that’s the way the chiropractor goes about practicing medicine. But that’s a perfectly disastrous way to think and a perfectly disastrous way to operate in the world. So you’ve got to have multiple models. And the models have to come from multiple disciplines—because all the wisdom of the world is not to be found in one little academic department. That’s why poetry professors, by and large, are so unwise in a worldly sense. They don’t have enough models in their heads. So you’ve got to have models across a fair array of disciplines. This seems to be a daunting task. How long will this take? You may say, “My God, this is already getting way too tough.” But, fortunately, it isn’t that tough—because 80 or 90 important models will carry about 90% of the freight in making you a worldly-wise person. And, of those, only a mere handful really carry very heavy freight. 4. 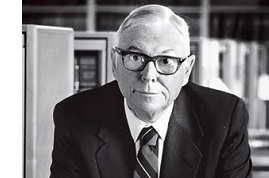 Why should we listen to Charlie Munger? The best 30-second mind in the world. He goes from A to Z in one move. He sees the essence of everything before you even finish the sentence. From all of the above I was able to answer my earlier question on experts. Experts are made and not necessarily born. After going through all this I decided to learn all the major models from multiple disciplines. Following are the sources I used to create the models. This is what i was looking for 🙂 thanks for the post. I will bookmark this! What you propose and have brought to light for me are remarkable. Thank you and I look forward to exploring this blog. Thanks and your comments made my day. Very nice blog and many thanks for posting . Thanks a lot for this wonderful blog. I have gone through many posts on this blog and learned a lot. I wish teachers take a note of this blog and learn how things are taught. This was a truly amazing article. Well done!! It is funny how I wish I knew Munger (read) when I was 10-15… But then again, I might not have understood the profouness of all these. Congratulations on the great compilation…. How did you actually make sure this is in your mind? Did you use Anki, mindmap or anything? I have been reading munger/bashi/buffett et all for a while but have never done anything systematically/methodically to make sure all those “facts” are in usable form. It’s easy to learn all this but very to hard to remember and use it in everyday life. I haven’t fully figured it out. But when you read and observe events keep asking why and relate it to these mental models. Anki and Mind Maps are fantastic tools and you should use both of them. I cannot thank you enough for this page as well as your other post blog. You are an inspiration with the way you share your wisdom with the whole world for free. Thank you, Sir. I cannot thank you enough for this blog. You are an inspiration with the way you share your wisdom with the whole world for free. Thank you, Sir. There is a extremely popular laughter show in a bengali GEC, named Mirrakel. You can find out about it in Youtube. Translated, Guru, where have you been for all these days! I humbly dedicate this phrase in the most humble manner to you. I roam about in many blogs and sites, few I ignore, few I read, few I bookmark, but I dont post anything. Today I had to post something here and that`s the best phrase that came to me mind. Your comment made my day. Thanks a lot. impressed by your reading voracity…how many hours a day do you read ??? Around 5 to 6 hours a day. I have read and admired several of your posts in the last six months. This one came earlier and I could get to it today from a link on today’s post on evolution. It would be great if this latticework can be explained for some real life situations. Keep up the good work. Do you live in the US ? Thanks. Yes I live in the US. Excellent post and exactly what I was looking for.hood work please keep it up. Jana, your compilation and insights are great stuff ! As you said it is easy to study and remember at least a few of them, but getting them on into the context via working memory is the most difficult part. The entropy of the immediate situation more or less bulldozes the ability of common people to pause and bring forth a practical result by applying the principles and getting a better solution for the problem at hand. Perhaps continuous application of the models in the context and reviewing how we fare would help us ingrain this into our working minds. Thanks for your comments. Learning mental models from multiple disciplines is the easy part. But using it everyday to be rational is the difficult part. Here is an excellent write up on how to put it to practice https://goo.gl/ZqDj9X. Thanks Jana. That’s another great site, by Mr Bakshi. The May 2015 issue of HBR carries excellent articles on cognitive and other biases and on decision making….these two points have a close link to the usage of mental models.